A little girl struggles to say who she loves and her dad couldn't make out the words. The two-year-old professed her love to country singer Luke Bryan during bath time. The video of the father-daughter episode went viral, followed by an in person meeting with the superstar. 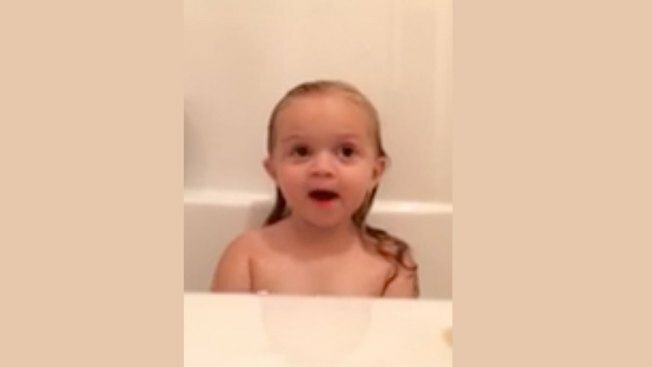 As Ava Finley took a bath last year, the toddler began babbling with her dad Jonathan Finley and he started shooting video of her chatter. At first, he didn't know exactly what she was talking about. "A little bunny? You look funny?" he asked. What the little girl from Calera, Ala. was trying to tell her father was — Luke Bryan! Her pronunciation was a little tough to make out. "I love him!" she exclaimed. Ava became a Bryan fan after listening to his music with her aunts. "Play It Again" is her favorite song. Ava's mom first shared the video on her personal Facebook page last year. After being nudged by friends, she posted it to Twitter in April of this year and tagged Bryan, who eventually saw the video and retweeted it. His record label got in contact with the Finleys and invited them to a concert and meet-and-greet this year. "She is really shy around people she doesn’t know. I was kind of afraid she would chicken out," said Ava's mom Adrian Finley. Dressed up in her cowboy boots and a white bow, Ava finally met Bryan before his concert in Atlanta on Aug. 23. Upon seeing her, Bryan scooped up Ava and gave her a big hug. He shared the moment on his Facebook page. "She was even cuter in person," Bryan wrote.